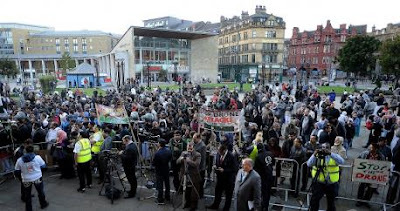 BBC's Look North reports that this evening some 2,000 demonstrators have gathered in Bradford's Centenary Square to protest against US drone strikes in Pakistan. Speeches have been given by, amongst others, George Galloway, Muslim convert Yvonne Ridley, and a representative of CND. 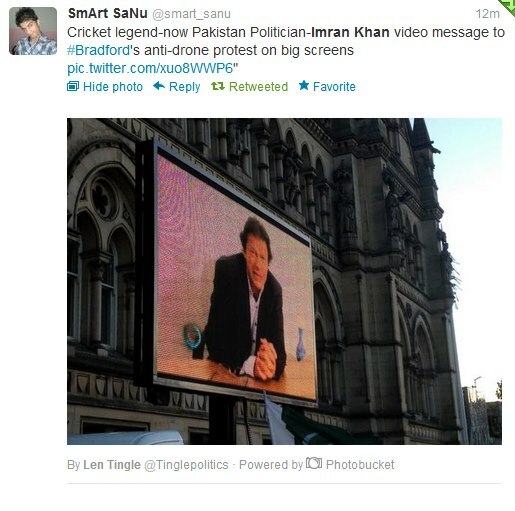 The Telegraph and Argus states that the organisers justified the demonstration on the grounds that British intelligence had assisted in the planning of the drone attacks; they anticipated a turnout in the region of 5,000. Imran Khan also sent a video message to the protesters. Galloway will presumably be hoping that his appearance this evening will divert attention away from his recent comments relating to what he termed "bad sexual etiquette" and "window lickers". Amongst the general public these have done his somewhat dubious image no favours whatsoever, but will they bother many of his "devout" male constituents? 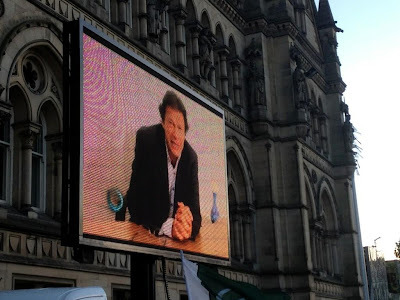 The latter, at a guess, will probably be more concerned with whatever he said tonight about a country far away that has no links with native Bradfordians. At least we can be thankful that thus far this evening, they have not resorted to the violence displayed by their co-religionists in Egypt, Libya, Yemen, Sudan, Lebanon and Tunisia using the pretext of an American film about the life of Mohammed. I have seen some bad films in my time, but the experience has never moved me to attempt to storm embassies and murder ambassadors; a few shakes of the head and critical exclamations have sufficed. UPDATE: The following morning, the estimated number of protesters was stated as being "hundreds" by The Telegraph and Argus rather than the 2,000 reported by the BBC. On Friday 28 September, Centenary Square will host a protest against the film 'Innocence of Muslims'. This is the first I have heard of the story, why? Noting on the BBC or Sky this morning. If this had been an EDL or similar anti-muslim protest both channels would have brought out their so called experts and debated the issue of 'right-wing' groups at length. When it comes to muslims why do the media let them carry on as though its normal behaviour? The whole thing sickens me. And as for pathetic Galloway he can just F' right off! Sorry for the anger but I hate what this country has turned into! This story had just one brief mention on Look North - the local BBC news - last night; I have not seen any coverage on the BBC website. Whereas we routinely hear about the costs incurred by the police and local councils in stewarding EDL demonstrations (actually largely incurred by the necessity of holding back their violent opponents amongst the UAF, etc), no mention of the cost of policing this demonstration was made by either the BBC or The Telegraph and Argus. You throw in an interesting question with the remark 'about a country far away that has no links with native Bradfordians' I am always amused by well spoken British Muslims who have birth certificates stating that they were born at the Bradford Royal Infirmary who then talk to me about going 'home' - 'home' being Pakistan ! They obviously fail the 'Tebbitt test'. Of course under our new 'coalition government' Tebbitt and his simple test of integration are never mentioned. He isn't on the same political planet as the likes of Cameron and Clegg. The question I am obviously coming to (after some diversions on the way) is what is your definition of a 'native Bratfordian' or indeed a 'native Brummie' etc etc ? That's a good point Ivan. On a number of occasions I have noticed the same sort of attitude amongst individuals of, for example, Pakistani extraction, who refer to Pakistan as 'home', and yet would bristle with anger were it to be suggested that this is not their country. Now, by using the term 'native Bradfordian' I am not of course implying that there is some ancient tribe indigenous to Bradford and that only those hailing from its line could be described as 'native', but I am rather referring to those citizens resident in Bradford who possess no competing affective ties relating to homeland or culture and who instead identify with Britain and the British peoples. As for Tebbit’s cricket test, it served as a decent metaphor for identifying those who felt themselves to be fully integrated citizens, although I must own that I do not follow cricket, and therefore do not actively support any team; thankfully though, as I say, it was only a metaphor. If this is indeed true I doubt it will ever be broadcast on the news or published in the mainstream press for fear of reprisals etc, after all the muslims always claim victim status even when they start it. Sickens me. The violence that has surged forth using the 'Innocence of Muslims' as a pretext is nauseating. As for the report you mention regarding the death of the US Ambassador to Libya, it is deeply chilling. However, there are no mass riots, killings, demands for action or terror attacks from the Christians, yet draw a picture of mohammed and the muslim world want to behead you for it! The islamic 'religion of peace and tolerance' is truly a messed up ideology! The difference in reactions is quite stark isn't it? I am relieved that Christianity has outgrown such ridiculous oversensitivity to criticism.